We’ve tried it, and we’ve loved it. Keep scrolling and read our product review on one of the best dining room lighting designs on the interior design market. DelightFULL is probably one of the best mid-century lighting brands in the world. The brand has a unique approach to mid-century design and has a variety of lamps that fit perfectly in every single project, regardless of the interior design style. Duke chandelier is one of the lighting designs they have that has been chosen by our team as the perfect dining room chandelier. Today we explain you why! This is Duke. Duke is part of Heritage collection from DelightFULL that incorporates chandeliers, floor lamps, wall lamps, and table lamps. Duke is also part of a family of lighting designs that includes a stunning floor lamp. Inspired by the simplicity of the 1970s, DelightFULL’s designers were able to create an iconic modern ceiling light that suits the most demanding setting. With a clear inspiration on jazz music, Duke boasts a heavy nostalgic 70s groove vibe that can’t be ignored. 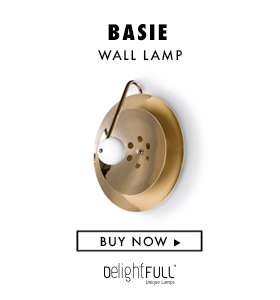 Produced in Portugal, it is handmade in brass and aluminum. The body, made of brass, has both a matte white and a gold-plated finish, while the shades are lacquered a glossy white on the outside. The inside is matte white, but it can also have a gold powder paint finish. However, the brand explained that you can personalize the mid-century chandelier by choosing the finishes you wish. But how do you think this mid-century lighting piece fits in an actual dining room? Well, DelightFULL has been part of a wide variety of interior design projects, and as you can see Duke looks stunning in an industrial dining room or even on a modern dining room. See it below! All in all, the dining room chandelier is probably one of the most amazing choices you are going to make in your interior design projects or home decor, regardless of the interior design style you have. With high-quality finishes and materials, Duke is a reliable and clever choice.